Diagram of a typical animal cell. 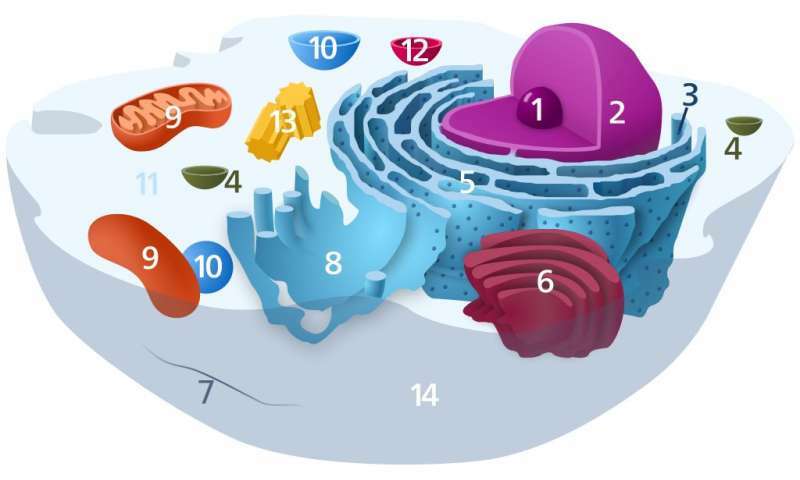 Organelles are labelled as follows: 1. Nucleolus 2. Nucleus 3. Ribosomes (dots on rough reticulum walls) 4. Vesicle 5. Rough endoplasmic reticulum 6. Golgi apparatus (or "Golgi body") 7. Cytoskeleton 8. Smooth endoplasmic reticulum 9. Mitochondrion 10. Vacuole 11. Cytosol 12. Lysosome 13. Centriole 14. Cell membrane. Credit: Wikimedia Commons. Scientists at St. Jude Children's Research Hospital have mapped key details of how molecular partners regulate assembly of protein-making factories called ribosomes. The findings, published in the journal Nature Communications, add a piece to the puzzle of ribosome assembly. The results may also suggest a pathway to new cancer drugs that target the hyperactive protein-production machinery that helps drive proliferation. The research provides a foundation for understanding the molecular mechanism of toxicity in amyotrophic lateral sclerosis (ALS), or Lou Gehrig's disease. Richard Kriwacki, Ph.D., a member of the St. Jude Department of Structural Biology, led the research. Ribosomes are assembled within the nucleolus in the cell's nucleus. The nucleolus lacks a membrane, making it different from most other cell structures. The nucleolus is organized via a process called liquid-liquid phase separation, which is like the colorful, undulating blobs in lava lamps that dynamically form, shift and fuse. In previous studies, Kriwacki and colleagues found that a protein called nucleophosmin helped organize the nucleolus and to regulate ribosome construction. However, a central mystery was how nucleophosmin interacted with an essential molecular partner called SURF6 to adapt the structure of the nucleolus as it assembled ribosomes. "We knew SURF6 was an essential gene, and that if you delete it, the cell dies; but its functional role wasn't understood," said one of the paper's authors, Diana Mitrea, Ph.D., a staff scientist in Kriwacki's laboratory. "We knew SURF6 interacts with nucleophosmin. But in this paper, we went deeper, showing how SURF6 modulates the scaffold structure that holds the components of the nucleolus." Researchers created nucleophosmin-containing droplets that mimicked the nucleolus' physical properties. They found that in the more liquid state—as when nucleophosmin is fostering the assembly of ribosomes—the protein partners with itself. However, when the ribosomes have assembled their subunits, SURF6 binds to vacant sites on the nucleophosmin molecule, which helps maintain the scaffold structure. "This paper provides insight into how SURF6 takes up the slack, in terms of the scaffold," Kriwacki said. "SURF6 is highly abundant in cells and is highly enriched in the nucleolus. We see it as playing a buffering role in terms of maintaining the scaffold in the nucleolus. "We are among the first to look at the dynamics of droplet composition in real time and quantitatively," he added. "It was fascinating to be able to simply add fluorescently labeled SURF6 to the solution surrounding pre-established nucleophosmin droplets and then watch over time as SURF6 enters those droplets—in so doing actually expelling some of the nucleophosmin from the droplet. The process essentially rewires the intermolecular interactions underlying phase separation within the droplets." Mitrea said the basic findings suggest potential cancer treatment strategies, because cancer cells have larger and more numerous nucleoli, producing more ribosomes for the protein synthesis needed to fuel cancer cells' rapid growth. Such cancer cells can resist biological stress signals that would cause them to commit suicide using a process called apoptosis. "One idea has been to make the nucleolus a drug target," she said. "For example, targeting the interactions between nucleophosmin and SURF6 could make the nucleolus more responsive to stress signals and overcome cancer cells' resistance to apoptosis." The insights into nucleophosmin and SURF6 will also inform research on the pathology of ALS. Kriwacki is working with chair of the St. Jude Department of Cell and Molecular Biology, J. Paul Taylor, M.D., Ph.D., who has identified abnormal toxic molecules that accumulate in the nucleolus and are associated with ALS. Kriwacki and his colleagues are working to understand how these abnormal molecules influence nucleophosmin's function in the nucleolus. Kriwacki and his colleagues are developing more complex laboratory models that not only mimic the interaction of nucleophosmin and SURF6, but also the assembly of ribosomes from their components. Researchers will explore the cellular signaling machinery in the nucleolus that governs ribosome assembly and will extend their studies to explore the processes within living cells.